One of the most awarded Irish whiskey in the world Redbreast is proud to announce the new official distributor in Slovakia which is Pernod Ricard Slovakia. Redbreast is currently the best selling single pot still whiskey. For those not familiar with the term, this sort of whiskey is exclusively made in one distillery only from a mash of malted as well as unmalted barley which is triple distilled later on during the process in traditional copper pot stills. The final result of the Midleton Distillery located in the County Cork is one of the most awarded Irish whiskeys in the world. The history of the brand, inspired by the namesake bird dates back to 1903. That was the very year when Jameson struck a deal with the company Gilbeys Wines & Spirits Import for a delivery of raw grain spirits from Bow St. Distillery. Back then distilleries carved out a niche for themselves selling whiskey wholesale to managers of customs impounds who were engaged in the business of importing fortified wine (sherry or port wine), so they had a great deal of empty barrels at their disposal to age raw whiskey right in the customs impounds. 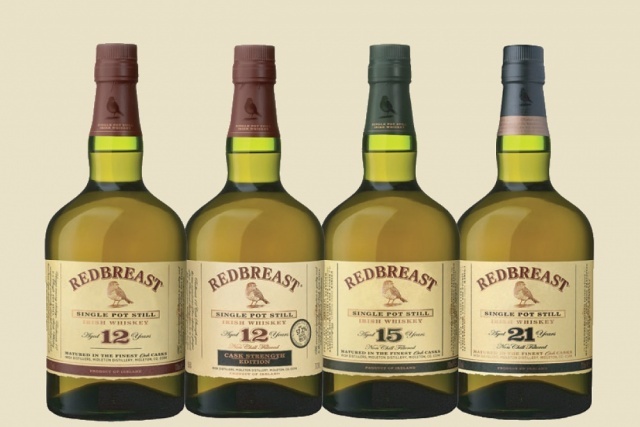 The brand pulled the plug on production in the 1980’s due to the fact that Redbreast ownership rights shifted from Gilbeys to Irish Distillers. 1991 was the year when the 12-year old Redbreast was relaunched on the market – since then on production has been ceaseless and the whiskey has been receiving unabated popularity. Pernod Ricard Slovakia acquired the rights of official distribution of Redbreast on the Slovak market in May 2016.